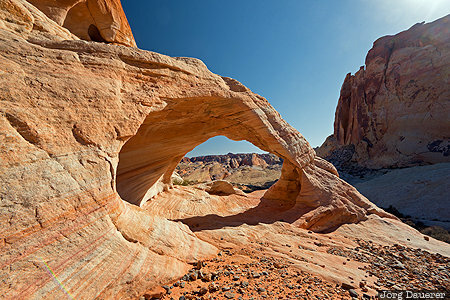 The natural arch Thunderstorm Arch in Valley of Fire State Park illuminated by warm afternoon light below a blue sky. Valley of Fire is in the south of Nevada, United States. This photo was taken in the afternoon of a sunny day in October of 2016. This photo is part of the exhibition Natural Arches (June 2014). This photo was taken with a digital camera.